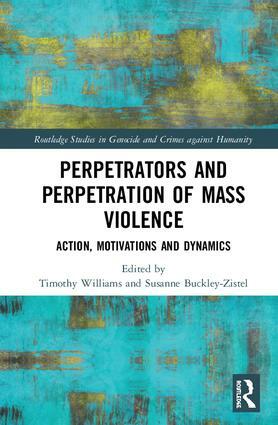 As the most comprehensive edited volume to be published on perpetrators and perpetration of mass violence, the volume sets a new agenda for perpetrator research by bringing together contributions from such diverse disciplines as political science, sociology, social psychology, history, anthropology and gender studies, allowing for a truly interdisciplinary discussion of the phenomenon of perpetration. The cross-case nature of the volume allows the reader to see patterns across case studies, bringing findings from inter alia the Holocaust, the genocides in Rwanda and the former Yugoslavia, and the civil wars in Cambodia and Côte d’Ivoire into conversation with each other. The chapters of this volume are united by a common research interest in understanding what constitutes perpetrators as actors, what motivates them, and how dynamics behind perpetration unfold. Their attention to the interactions between disciplines and cases allows for the insights to be transported into more abstract ideas on perpetration in general. Amongst other aspects, they indicate that instead of being an extraordinary act, perpetration is often ordinary, that it is crucial to studying perpetrators and perpetration not from looking at the perpetrators as actors but by focusing on their deeds, and that there is a utility of ideologies in explaining perpetration, when we differentiate them more carefully and view them in a more nuanced light. This volume will be vital reading for students and scholars of genocide studies, human rights, conflict studies and international relations. 11 Is a Comparative Theory of Perpetrators Possible? Timothy Williams is a post-doctoral research fellow at the Center for Conflict Studies at Marburg University, Germany. Susanne Buckley-Zistel is Professor of Peace and Conflict Studies and Director of the Center for Conflict Studies, Marburg University, Germany. The Routledge Series in Genocide and Crimes against Humanity publishes cutting-edge research and reflections on these urgently contemporary topics. While focusing on political-historical approaches to genocide and other mass crimes, the series is open to diverse contributions from the social sciences, humanities, law, and beyond. Proposals for both sole-authored and edited volumes are welcome.